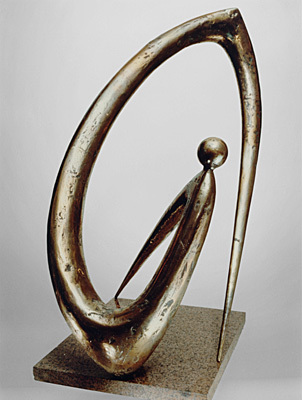 Bronze, granite, height 550 cm. Portrait of Fr. P.A. Florensky. 2007. Bust monument to F. Dostoyevsky in Tallinn. Aleksey Kozyrev: Valery Andreyevich, you belong to the post-war generation, but your childhood fell on the war time. Do you remember the war? (The question is about World War II, or the Great Patriotic War, as it is known in the countries of the former Soviet Union. – Translator’s note). Valery Yevdokimov: I remember the war because of some indirect circumstances. I was born before the war began. I recall our trip in a freight wagon as we were ‘going to evacuation’ in 1941. Our destination was Yekaterinburg in the East Urals, which at that time was named Sverdlovsk after the first Soviet president. We headed east, occupying some space on the floor of a ‘teplushka’ – actually a small freight wagon which was accommodated for four refugee families. The wagon had berths and door openings on either side of the track, but of doors there were none. Just wagon walls and the two door apertures were meant for loading or unloading cargoes. Each half of the wagon was divided horizontally by berths, but there were no curtains of any kind, of course. The train would make a stop and people would go out ‘to the nature.’ I can remember quite well one particular stop. A siren sounded to warn people of a coming bombing. I also remember our life in Sverdlovsk. I went to a kindergarten there. After some time my grandmother and me went from Sverdlovsk back to Moscow. I think that this happened late in 1943. I also remember a New Year celebration, 1943 to 1944, or 1944 to 1945. We went to a new-year party some place, just in our woolen boots, with no galoshes on, with unpadded soles. Snow just lay on the ground and did not melt. A.K. : You said that your father was a victim of the reprisals. What made him a victim? V.Ye. 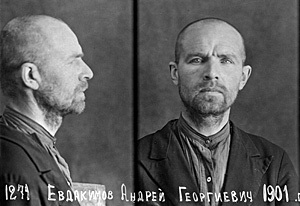 : He was an agronomist, unjustly arrested in 1942 and shot one month later. The one immediate reason of his arrest was him saying somewhere that the Germans had been better prepared for the war than we were. He was not, to put it mildly, a supporter of the Soviet regime. It was his conviction that the war would result in its collapse, or its weakening at the least. Russians would overpower Germans by all means, but the war would help to do away with the regime. In fact, it was possible for me to enter my college only because I did not mention in my CV that my father had been a victim of the reprisals. My mother was clever enough not to apply to any government offices to seek state aid in compensation for her husband’s arrest, although she was entitled to such aid. She was careful not to harm me or my brother. Mother worked throughout her entire life: she first graduated from a teachers’ college and then from a music school. She was about to enter the conservatoire when the war broke out. During the war she worked at a galvanizing factory where they manufactured medical tools, and where she earned herself eczema. Well, she later worked as a teacher and as a musician in kindergartens. A.K. : You were artistically formed within what we call ‘Soviet culture.’ Were there in it any bright aspects which contributed to your self-realization? V.Ye. : What valuable things were there in the Soviet plan of life? What was it that allowed people, what allowed me to grow artistically, to receive positive impulses? I see all the positive influence of the Soviet culture as the continuing impact of the Russian culture of the pre-revolutionary times. That culture still held alive. And some pre-revolution people were still living. A teacher of mine, Petr Pavlovich Vvedensky, who taught astronomy in my school, used to teach at a high school in the imperial Russia. People were still alive who had been brought up before the 1917 revolution, or who were educated by those who lived before the revolution. Hence this strong cultural foundation continued to exist for some time. Not even in politics was it possible to deny certain cultural, and even humanitarian, values. They continued to be proclaimed, albeit actually demagogically. This phenomenon was maintained not by those proclamations, but by the inertia of the tradition. A.K. : Was the Soviet culture romantic, ideal-oriented? Was it Utopia nourishing the desire to become someone, to create something, to be above others in some way? V.Ye. : There actually were, of course, elements of Utopia in the Soviet culture. I see that phenomenon as a positive and romantic frame of the collective mind of the Soviet population, that is, of its most conscientious part. One positive factor was that an artist did not have to engage in mercantile affairs. Thus more of artists’ energy was directed at cultural and creative purposes. People lived in a somewhat affected manner but, on the other hand, they stayed separated from the world of merchandizing. A.K. : That means that the artist did not have to think about how to sell his work? V.Ye. : In my time there existed already quite a developed system of providing artists with employment. When I began my artistic career the artistic fund system was operating in its most efficient form. There was in force an official government provision according to which 2 percent of the construction expenses, all over the Soviet Union, were specially allocated for artistic purposes. Any company that engaged in construction, was obliged to spend 2 percent of the cost for artistic decoration. That implied propaganda of the Soviet system, of the Soviet way of life, with political tasks in view. A.K. : That was something like social advertizing? The 2 percent were spent for a kind of social PR purposes? V.Ye. : Yes, that much had to be spent for affirming the communist ideals. But people are human anyway. A certain part of the jobs commissioned plainly fulfilled the predetermined idealistic tasks. There were artists who were engaged in this and hence they were becoming the wealthiest ones. Let us take for example the Mamayev Kurgan WWII memorial complex in Volgograd (Stalingrad). Securing such a mammoth funding was only possible in connection with the theme of the war. But, just the same, this could only be done by an artist of the Vuchetich caliber, who had an outstanding gift in that respect – he was well received both by the top brass and even by the Soviet government. He came to our college in order to put together a troop of young sculptors who would be able to go to the site and do some work there. It was announced that one could go there for a month or for a couple of months and even receive some money for the job. I volunteered at once because the college was somewhat dull at the time. A.K. : So you took part in the creation of the Mamayev Kurgan memorial complex? V.Ye. : I wouldn’t call it taking part in the creation of the monument because at that time the main idea had not yet been found. Subsequently the idea of the plastic, formal rendering was borrowed from the Paris Commune Memorial. The Commune fighters, executed by the firing squad, are as if stepping out of the brick wall. This artistic idea was used at the Mamayev Hill. They went to represent the walls of Pavlov’s House (defended against nazis by sergeant Pavlov’ men for two months in 1942) by bringing to the site huge pieces of walls dotted with nazi shell splinters. They took those panels and built out of them huge human figures reaching up to 12 meters in height. But that was some time later. Well, when we arrived in Stalingrad there was nothing at the memorial site, and we were told: ‘Do whatever you want and we shall see what comes out.’ So I started to sculpt a machine-gunner’s head and hands. Vuchetich said he liked my work but it was incomplete material which was quite divorced from the overall rendering of the monument. Later, when the conceptual idea was finally found, all our opuses were plastered over and now there are no any traces of our contribution there. On the other hand, I had some experience of working with gypsum on a real wall. This happened in 1963 or in 1964 when I was a forth-year student. Then the memorial was inaugurated in 1965. A.K. 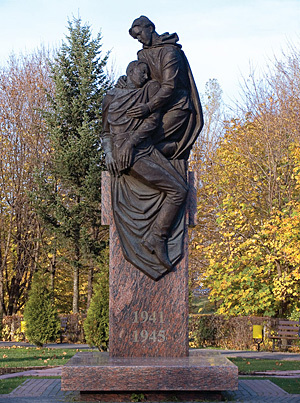 : When you were a mature artist you were to make a monument to fallen soldiers in Khimki near Moscow and you used in that work a subject of Christian art, that of Pieta. We can see in Soviet culture artists turning to religious subjects: Motherland is actually Oranta, Praying Mother of God. Did you realize the fact that you were turning to religious contexts of art? V.Ye. :I did realize that quite well. I used an interpretation that is proper to Christian church art, the subject of Pieta*. It is my opinion that many monuments that were erected in various parts of the Soviet Union, and some that continue to be put up, are designed in the style of the Soviet times. This is a kind of exhibitionist patriotism (jingoism) which does not reflect the tragic aspects as the price paid for the Victory. Those works of art are performed at quite a professional level, and are performed by sufficiently well trained artists. But the interpretation which they adopt, and with which they win in artistic contests, it carries no dramatic charge. Their monuments lack, as a rule, the complexity in the subject, the philosophical content of the subject, which always comes to be composed of contradicting and contrasting components. Ruling the roost is the approach of festive and superficial apotheosis. This is the reason why those monuments make people stay impassive. I am grateful to the Khimki town authorities, and in particular to the mayor – for choosing this design of the monument from the many versions suggested. That was the decision taken by one person. It could be his inner human self that spoke. I do not think he would have chosen this monument, had he been better professionally versed in the subject. It was human approach that stood out bare, a genuinely human glance at the theme and the selecting eyes stopped at that version. A.K. : And what is, may I say so, genealogy in art? Have you been influenced by the art of avant-garde, constructivism, by Tatlin? V.Ye. : I discovered for myself, somehow from the very beginning, Leonardo da Vinci and Michelangelo. That happened even before I entered my art college. I was astonished by their mastery. There was born in me the desire to come close to their art, to master it, as far as it would be possible, of course. The desire was so overwhelming that, when the time came to get prepared for entering the College, I did not choose the academic method of drawing, although that was necessary for the examination. That was a one-hundred-percent guarantee for entering the College, if the drawing is well done… I chose the manner of Leonardo da Vinci drawing, he drew with his left hand. His stroke was the same all the time: from the upper left-hand corner to the lower right-hand one. He made all his drawings in this way, and did the shadowing, in the manner of this ‘rain,’ as we call it here. Since I am not left-handed, I began to draw in the same rain manner, only by a mirror-reflection method. Then I became a second-year student, a third-year student. 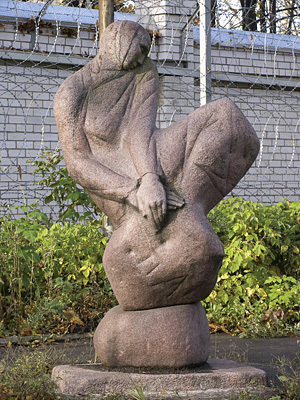 Literary works of Solzhenitsyn made their way into our College as xeroxed copies, and so did black-and-white reproductions of Henry Moore**, twentieth or thirtieth reprints. So my artistic conscience, as they say, began to be rapidly transformed. And, naturally, while I continued my studies at the College according to its curriculum, they were the new tidings that were seen as genuine creative art, as a way taking me beyond the limits of the curriculum and farther on on a free voyage. I began to put into practice in my College those new tiding ideas of composition and of form. Moore, for one, produced an indestructible impression on me, one which I have kept for my entire life. Now I look at all those things more quietly, but there is present that influence in my first works, the ones done back in 1964 whilst I was still in the care of my Alma Mater. V.Ye. : I made those discoveries for myself some time later. For one, they had not yet exhibited Tatlin’s ‘Tower’ at the Tretyakov Gallery. It was somewhat later that I discovered for myself the art of avant-garde as such. It was the Renaissance that was the first to come, followed by the modern western art. A.K. : This means that avant-garde was not valued in the official Soviet tradition? V.Ye. : It was not a learning subject, it did not exist. I discovered it for myself after the College. Moore did not provide, of course, any radical conceptual rendering of compositional space in art. 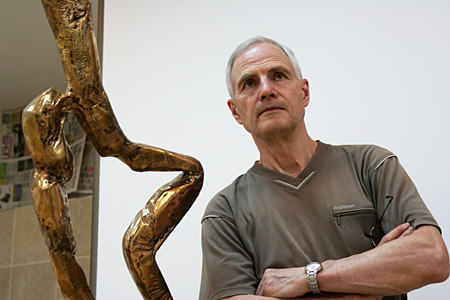 He made sculptural pieces of his own. His one strong aspect is that the plasticity of the human body is still discernable. I think that this is the basis of all the spatial discoveries in art. Once it is present, this is art, and where it is absent, there is no art there. It was in this way, by reaching to the art of avant-garde, that I made my first sculptural discovery for myself, that of the phenomenon of Tatlin. He was very talented. He made remarkable realistic drawings and sketches from life. One can see clearly that he was a very gifted person with a broad spatial perception of life. In his ‘Tower’ Tatlin laid the foundation of spatial rendering in art for the foreseeable future. This is co-relation of two forms, each one of which is developing along a spiral, the co-relation of two forms in diagonal inclination, in diagonal direction. This is what Rodchenko meant some time later when he said that the art of the future would be largely subjected to the movement of the diagonal. Tatlin brought together two diagonal movements to produce energy, tension, overcoming. 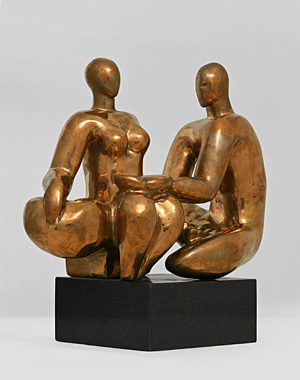 It was play of two forms that he combined in diagonal movement, mutual relation between two spirally shaped forms. This is, actually, the sculptural and spatial, aesthetical and artistic solution. There is here, though, one important detail. These dynamic forms operate against the background of a vertical line because inside the tower there are vertically arranged forms. They are provided for the purpose of contrast and make the starting point for the movement of the spirally-shaped forms. Realization of all these aesthetic merits of this work by Tatlin was coming to me gradually. I felt at once by intuition that there is some grain there which cannot be missed if the artist aspires to work in modern art and if he masters an artistic thinking of space. A.K. 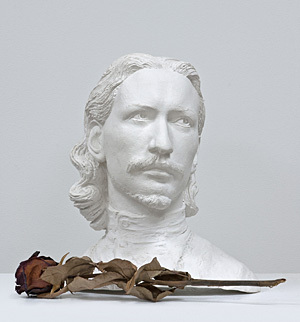 : I noticed that a sculptural portrait of Florensky stands in your studio with a withered rose before it. I see here the same principle, the sinusoid: his glance directed at an upper corner of the room, his lowered head, and his curly hair. V.Ye. : This is true about any work, be it a portrait or a figure composition. And this is what empathizes the three-dimensional character of representation in the fine arts, including sculpture. A.K. : And how have you arrived at the ‘Russian’ theme? The one at which you have worked for the past twenty years. V.Ye. : Beginning since 1978-1979. After reading writers of Russian religious philosophy I realized the necessity of understanding the meaning of the Old Russian art, and of using in the contemporary art its principles and its discoveries. A series of my compositions of the 1980es is devoted exactly to implementation of these principles: supplying to works of art certain spiritual properties, instead of formal ones. To put it in more detail, I did not even make a particular use of inverted perspective. True, I saw that it exists but I did not take it as some discovery which would provide artists with a new artistic solution. To provide an example, I will tell you the story of a work in commemoration of Andrey Rublev, which explains how I came to conceive and approach the theme. I realized that it is not Rublev’s ‘Trinity’ itself that should be looked at, but we should look at what happens when a worshipper comes to pray before it. The icon was not in a church but it was kept at the Tretyakov Gallery. So I went to the Tretyakov Gallery, to the hall where ‘Trinity’ was hanging, found a seat in a corner there, and began to watch what happened when people looked at the icon. I attempted to unfold the ‘Trinity’ composition into a three-dimensional perspective and to complement the three-dimensional image of the icon with the fugure, also three-dimensional, of the gallery visitor-worshipper. This composition originated actually from that idea. It is a different matter as to how successful it is. There are certain drawbacks in it too. And this is explained by the fact that the work was done by efforts of one man, while, Rublev, anyway, painted proceeding from the experience of a culture of several centuries. What I want to say is that I came to approach the Russian motif through a discovery, through a delightful discovery for myself, of the principles of composition in the Old Russian art. I continue to hold until now the opinion that those principles that were realized in the Old Russian icon of the 14-th and 15-th centuries, are unique in their character, and that by their artistic merits they are far above the experience of perceiving the Evangelical events, that were provided by the Western art at about the same time in history. A.K. : During the 1970es there appeared the artistic trend of making what can be described as disguised pilgrimage. Artists took to visiting the Optina Pustyn monastary, to look at destroyed churches there where there actually was no church life in the proper sense of the word. V.Ye. : Yes. That was when Dmitry Galkovsky and I went to the Optina. He was then still a university student, or a recent graduate. But that was not the only case of my pilgrimage. I went to all the places that could be visited by pilgrims. Including the Therapontovo Monastery. I did a piece of sculpture on the subject also as an attempt to ponder and understand the situation as a whole, the object being not only church arts or the architectural merits of the Old Russian construction style. I made a special piece on this subject – ’Cathedral.’ Proceeding from this work, I approached the subject of personalities in the Russian religious philosophy. Partly also through Galkovsky who put forward my candidature when there turned up an opportunity to start working on a design of a monument to philosopher Vladimir Solovyov. A memorial stone was laid at that time in the courtyard of the Institute of Philosophy in Moscow. The Dostoyevsky Memorial Society invited me as the prospective monument-maker to the ceremony of the stone laying and consecration. It was since that time that I began to study the personalities, the writers who have created the unique phenomenon of the Russian religious philosophy, the one phenomenon which enables Russia to pose in the international arena as a wholesome entity with a thinking of its own. A.K. : There are people who are of a different opinion. Some philosophers hold that there does not exist any Russian philosophy at all, that all that we have are vestiges of western mysticism, Jakob Bohme***, and German Romanticism. Do you take the Russian religious philosophy as a wholesome notion which provides you with impetus for your creative work? V.Ye. : Yes, it was an epoch of discoveries. I read one book after another, starting with Vladimir Solovyov. Next came Berdyayev, Florensky, Rozanov, and others. I saw my prospect which was very important not only for creative work, but for personal life as well. A.K. : Have you not been disappointed as far as that vision is concerned? Back in 1997 I had a discussion with Yury Afanasyev, the rector of the Russian State Humanitarian University. We went together to Toulouse, France, and Yury Nokolaevich said during a dinner: ‘Yes, this is how the Russian philosophy is – it has always been attracting, calling you, enveloping you. But where is it that it calls you to go? V.Ye. : But this is exactly what is valuable – the feeling of perspective, the charming effect of something that attracts you. But which philosophy makes things happen in real life? There is none. Take any western author. All of them write without providing solutions of the basic issues, what they offer are only visions that are distinctly their own. But such a vision is not realized during the existence of a particular human person. And this happens because there remains unresolved the one principal problem – that of immortality, that of the attitude towards eternity on the part of humans as finite beings. A.K. : Well, there is a philosophy which proceeds from finitude. Take Martin Heidegger, for example, and his ‘being-toward-death.’ One aspect is there that immortality is something undesirable and unnecessary. V.Ye. : As far as I understand it now, that would be actually destructive for life. To put it in other words, I have not been disappointed in these authors because I am grateful to them for the upsurge of inspiration which I experienced as I was getting to know their works. It was for me a period of discoveries, a period of spiritual development, without which I would not have done what I did subsequently, because my creative work began to enter gradually the mainstream of realization of new ideas. Tatlin provided rather a formal support, while they were the ideas of the Russian religious philosophy that served as the spiritual pivot and were, so to say, the prime mover for the creation of sculptural models of these instances of spiritual experience. A.K. : And you also have begun to enter the Russian philosophy, because the images which you have created -- Florensky, Rozanov, Dostoyevsky, Solovyov -- it is difficult now to imagine without them the history of the Russian philosophy. This is a certain kind of reading, we speak about the history of the Russian philosophy of N. Lossky, V. Zenkovsky or G. Shpet. They are interpretations while they are also texts of Russian philosophy. The same is true about your works – as interpretations they also are included into the history of Russian philosophy, and they are non-verbal philosophemes. V.Ye. : I am flattered by this comparison although I do not think that my contribution is so significant. I would say that these are prolegomena to those solutions which are bound to take place, may be not necessarily in my creative work, but in works to be performed by other artists. A.K. 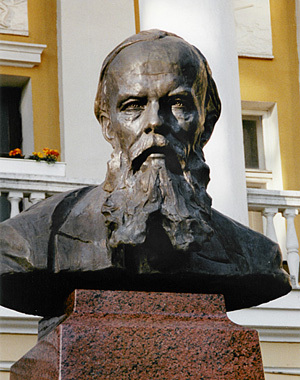 : Why is it that we have so few monuments to Russian philosophers? They are erecting monuments to all sorts of people: to recently deceased men of literature and to political figures, but they put up no monuments to famous classics that have brought world fame to Russia, state provides no funds for them. Your story of the monument design for Solovyov is very sad. It will soon be twenty years of your trying to build that monument. V.Ye. : The problem is easy to resolve. It is a fact that if some person is elevated in public eyes, and if that person comes to carry a moral halo, the issue will arise invariably that that person must be imitated and that life must be organized according to his principles. But this is a very difficult task. It is very difficult even to understand his example and adopt it as something that is attractive to yourself. One needs to become spiritually mature for that task. * Pieta -- a representation of the Virgin Mary mourning over the body of the dead Christ, usually shown held on her lap. ** Henry Spencer Moore (1898 – 1986), an English artist and sculptor who worked in the genre of figurable monumental plastic arts. *** Jakob Bohme (1575 – 1624), a German theosophist, visionary, and Christian mystic.